Steel trellis sculptures for transforming your world! 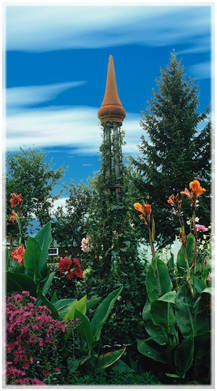 This graceful tower steel trellis will add sweeping vertical lines to your landscape design or garden. 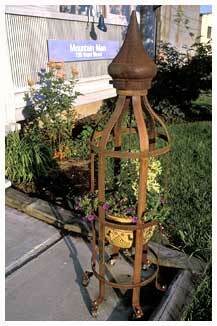 Made from welded steel and topped with a unique cast iron pinnacle, this sturdy trellis will withstand all weather extremes and support your flowering or fruiting vines, both annual and perennial, for many years of trouble free garden service. We produce both interior and exterior trellis models and both are available lighted or unlighted. Our lighted units are ideal for entry or garden lights and are UL approved. Interior models are equipped with a planter support base and non-marring rubber casters for ease of movement. Built to the durable and aesthetic standards of our traditional Mystic Trellis products, the Mystic Karma Kiosk is a home or office decorator's answer for a pleasing and unusual complement to both interior and exterior design requirements, providing an attractive and highly versatile platform for the display of favored plants, family and business heirlooms, or a myriad of other applications. Choose from 2 handsome and sturdy steel mailbox supports. 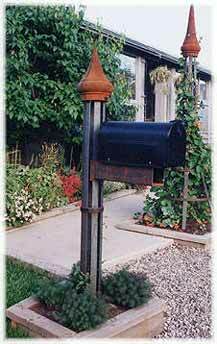 The trellis style mailbox support can be equipped with a light fixture. 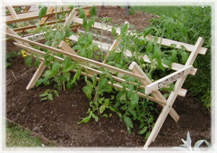 Tomato growers will love our compact folding cedar trellis. The design cradles the tomato plants, hence the name Tomato Manger. It folds flat for easy off season storage. Buy 2 for the same shipping cost as buying one! Custom fabrication orders are accepted! Download our brochure for viewing (file size, 800k) with the free Adobe Acrobat reader. If you need to download the free Acrobat Reader, CLICK on the icon.